The R-H150 ring roller is a double pinch design that has two independent bottom rolls and one fixed top roll. 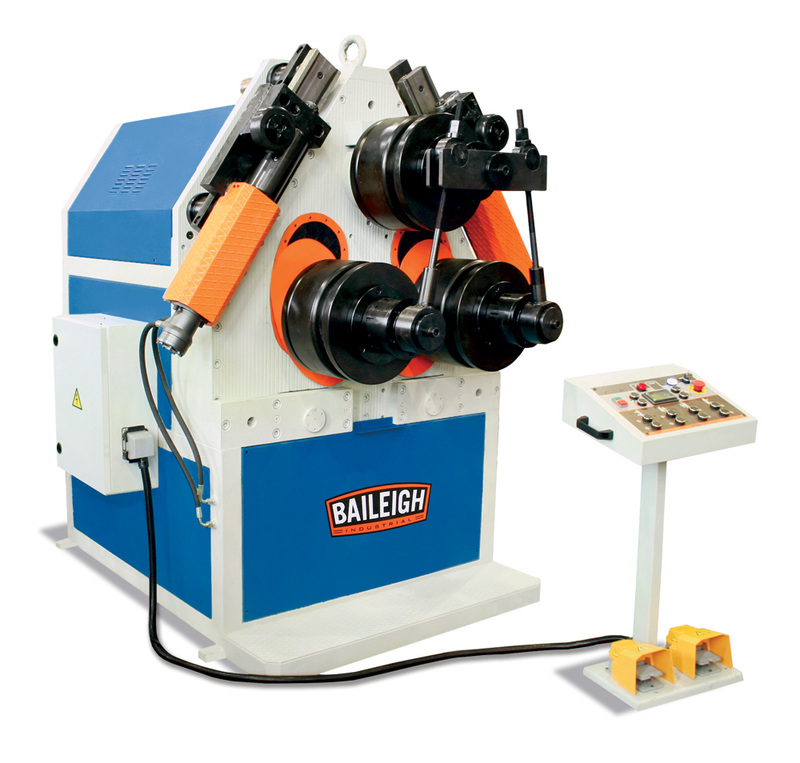 The advantage of this type of section roll bender is that the operator can pre-bend and post bend the material which saves valuable production time, material, and allows for tight rolling. The bottom rolls have independent hydraulic controls tied to an encoder for the exact position which is displayed on the programmable DRO controller. The programmable DRO controller can have a preset bottom position as well as a preset top position that makes this tubing roller a repeatable bender which is a must have for larger production runs of tube, pipe, section, or angle iron. This ring roller consists of a very heavy steel plate frame that is electro welded and tied to a heavy duty industrial grade hydraulics drive transmission that powers all three rollers. This heavy duty design has a SiemensÂ® inverter drive to allow for soft startups of the main motor, as well as overload protection when bending at maximum capacity. The lateral roll guides and angle guide rolls are independently hydraulically driven for fine tuning when coiling. This tubing roller is capable of bending up to 6-1/4" round tubing and 4-3/4" x 4-3/4" x 1/2" angle iron, making it a very powerful section roll bender for a great price. The R-H150 ring roller comes standard with hydraulic drive of rolls and 2 axis guides, segment rolls, and a simple to use operator pendant. The operator pendant houses all main controls of the machine and can be moved to the proper position to operate the tubing roller. This machine can operate in the vertical or horizontal position as required for the job. 79"€? / 59"€? / 80"